Eileen Linklater, EMEC’s Client and Marketing Manager reflects on how far we have come in the marine energy sector, as the first prototype turbines tested at EMEC graduate to array projects. 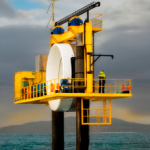 When I joined EMEC in 2009, there was one client with a tidal turbine in the water – an Irish company called OpenHydro with their first small scale test turbine – the first to generate tidal power to the grid in Scotland. 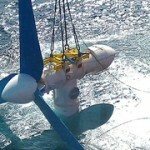 That same year we gained another new client called Atlantis Resources Corporation, with headquarters in Singapore at the time – the first company I signed up to test a full scale tidal turbine. The vision that government had in 1999 to create a test centre which would attract technology development companies from here and abroad to harvest the vast wave and tidal resource around our coastlines was beginning to take shape. EMEC has now seen 27 different iterations of wave and tidal devices from 17 different companies from 9 different countries deployed in Orkney, and every single time someone steps off the pier they still learn something new in our watery classroom. We live and breathe innovation, through learning by doing. As a client once said to me: “you have to find the problems before you can find the solutions”, and boy have we seen some innovative solutions. 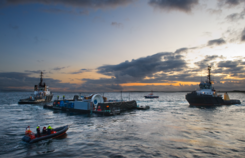 OpenHydro learnt from early experience at our tidal test site that installation in challenging tidal conditions could be incredibly difficult and costly, so they adopted the simple gravity based foundation and deployment barge they use around the world today. 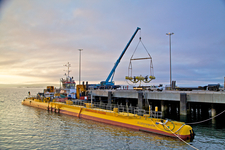 Atlantis studied site development, so whilst they continued with their technology development at EMEC, they secured prime position in the Pentland Firth for the world’s largest tidal array – MeyGen – in parallel. Back in 2009, I joined EMEC full of hope that introducing a new form of renewables into our energy mix would help us contribute towards tackling climate change. I now see that marine energy still offers this, but much more besides. The research activities in and around EMEC have a supply chain that stretches the length and breadth of the UK, and the latest economic impact study done on EMEC reported an estimated GVA (Gross Value Added) of £250m to the UK economy. And that’s just from testing activities. The goal was never just about low carbon technology, it was also about EMEC supporting the development of a new industry. A new industry building on the proud maritime heritage we have in this country, creating highly skilled jobs and export opportunities, as well as contributing towards security of electricity supply. Two weeks ago Atlantis exported electricity from their first turbine installed in the MeyGen project off the Caithness coast; the first of four 1.5MW tidal turbines (Atlantis and Andritz turbines) that are to be installed in the Inner Sound as the first phase of a 400MW project. Then last week, OpenHydro generated the first electricity to the grid in the Bay of Fundy in Canada from a 2MW tidal turbine. They now have a global pipeline of projects totalling almost 1GW. These turbines were tested at EMEC – our first graduates. There are others hot on their heels too – Scotrenewables with the SR2000, and SME with PLATO, both making their preparations for next term on the tidal test site. Not to mention the smaller scale nursery classes where we see a new surge of wave and tidal companies readying themselves for the sea. So just seven years on, here I sit, having witnessed two of EMEC’s clients achieve incredible milestones in the development of the industry – for both domestic energy supply and export markets. The vision has been realised, thanks to clever, early investment in R&D. Like every other industry, the work now continues to drive down costs and efficiencies through continued R&D investment. I am extremely heartened to see the UK government announce £2bn a year for science and technology R&D so we can continue supporting this industrial innovation and retain our world leading status.